In some home cinemas, the separate processing paths taken by audio and video mean that they can arrive at your speakers and display at fractionally different times. This lack of sync between the two can seriously detract from the AV experience. 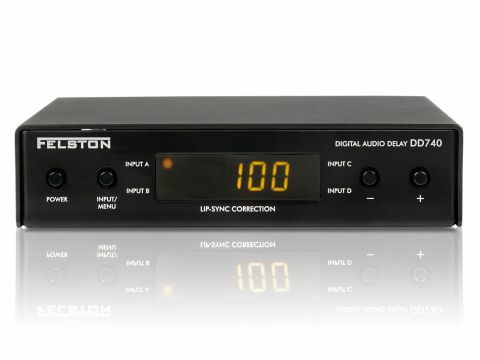 Most AV amps have a programmable audio delay to compensate for fixed lip-sync error - but few offer sufficient delay for HDTV and most disrupt the image with menus during adjustment, making it impractical to tweak as lip-sync error changes from one programme or DVD to another. So if you want to really eliminate lip-sync error you might appreciate this useful product. With the DD740, incoming data from the source that needs correcting is written into internal memory, from where it's read out a short (and user-definable) period later. As a result, it's delayed relative to the input, thereby bringing it back into sync with the video. Two buttons on the remote increase or decrease delay in 1-millisecond steps which, thankfully, can make a huge difference to sync, and in fine tuning mode, you can even alter the delay by a third-of-a-millisecond steps.